A quarter of a century may not seem like a long time, but like the mobile phone, or the internet, it is difficult to imagine exactly how we lived before our towns were filled with the distinctive whine of straining electric motors or the hillsides strewn with panting red-faced drivers that so characterise the environment in the post-C5 era. 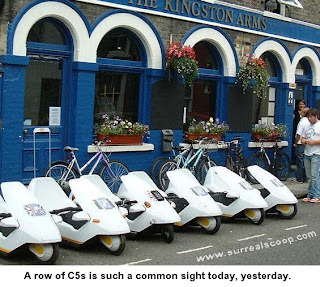 25 years ago this week the streets of the UK, and the world, were completely free of Sinclair C5s. Pavements outside coffee shops, libraries and intensive-care units at hospitals were not lined with rows of scattered and crushed electric tricycles, plugged into pay-as-you-go electricity points. Professor Billingsworth has studied the effect that the C5 has had on our culture, behaviour and the industries that have sprung up around it. “You probably don’t remember when all drive-through take away places had the speakers and counters at stomach height? Now, because of the C5 they are all at knee height. Yet few people understand why,” said the Professor. Professor Billingsworth’s research has documented testimonies from ten of thousands of people recalling their experiences with the C5 and how it has changed their lives. In our C5-centric society it is also difficult to remember a time before drive-in cinemas where young, panting couples can park near each other and recover from the exertion of overcoming the ramp into the car park. Wearing only their winter thermals and duffel coats they happily spend a romantic evening shouting sweet nothings through scarves and earmuffs across the gap between vehicles.